Army SSgt. Kyle R. Warren - Run for the Fallen New Hampshire, Inc.
with an improvised explosive device in Tsagay, Afghanistan. Kyle was hard to miss, whether tearing down a rugby field or running toward a firefight through muddy poppy fields in Afghanistan. Though an intimidating bear of a man at nearly 6 feet 3 and 240 pounds, Kyle was a fun-loving, warm-hearted guy who made friends effortlessly with his disarming, sometimes goofball charm, family and friends. Kyle was born and raised in Huntington Beach, CA and in 2003 moved to New Hampshire with his mother Lynn. After graduating from Marina High School in Huntington Beach, going to college off and on, and playing lots of rugby, he appeared to find his groove in life when he enlisted in the Army in October 2004. He joined the elite Special Forces as a medic, with plans to become a firefighter-paramedic or physician's assistant when he left the service. "He really seemed to be on his way," said his father, Del Warren. "He had just turned into a fine young man." He was living in Manchester when he joined the Army and headed for basic training. After basic and advanced individual training at Fort Benning, GA, he was assigned to the John F. Kennedy Special Warfare Center and School at Fort Bragg, N.C., in May 2005 for Special Forces training. His medical training was with John F. Kennedy Special Warfare Center and School at the Joint Special Operation Medical Training Center. He earned the coveted “Green Beret” in 2007 and was assigned to 1st Bn., 3rd SFG (A) at Fort Bragg as a Special Forces medical sergeant. In 2009, Kyle married his longtime New Hampshire sweetheart, Sandra. 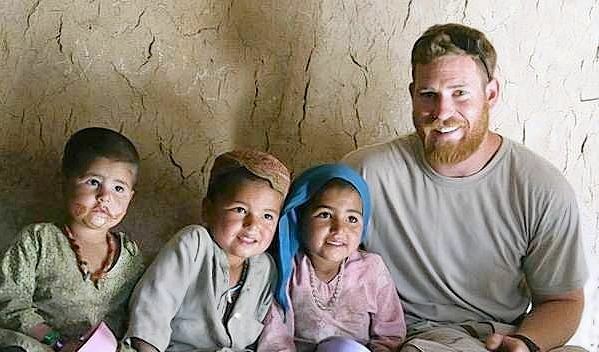 On July 29, Kyle was one of two Special Forces soldiers killed by a roadside bomb outside Tsagay in southern Afghanistan's Helmand province, on the Pakistani border. Also killed was Capt. Jason E. Holbrook, 28, of Burnet, Texas. Kyle and other members of his Special Forces unit had just finished meeting with town elders when they were attacked by small-arms fire, according to his father, who received a redacted Army report on the circumstances surrounding his son's death. Warren and Holbrook were on an all-terrain-vehicle during the firefight when they were hit by the explosive, his father said. Officials at the U.S. Army Special Forces Command said Warren and Holbrook were killed during a combat reconnaissance patrol. Kyle was his team's medical sergeant. He had just arrived for his second deployment in the area, having already served in Pakistan and Afghanistan. "He was always top notch, and he took his job as a medic very seriously," said friend Jay Daniel of Jeffersonton, Va., a Special Forces veteran who trained with Kyle and served with him during his first deployment. "Kyle helped save lives, and he was always the first to volunteer if we had a mission." Daniel said that, along with aiding other soldiers, Kyle and other medics in Afghanistan provided healthcare for the elderly and sick during weekly town clinics. Kyle also rushed to save the lives of two boys in Afghanistan nearly killed by an improvised explosive device, which had seriously wounded their arms and legs. "There are two boys walking around southern Afghanistan today because of Kyle," said Daniel, who named his newborn son after his friend. Kyle’s military education includes the Survival, Evasion, Resistance and Escape Course; Basic Airborne Course; Basic Noncommissioned Officer Course; Warrior Leaders Course; Special Forces Qualification Course; Special Forces Advanced Urban Combat Course and Military Freefall Course. Kyle is survived by his wife Sandra, mother Lynn and stepfather Ed Linta, father Del and stepmother Jill Warren, and his extended family. Members of the Fort Drum Barracks Rangers Rugby Football Club (RFC) traveled May 20 to Manchester, N.H., to play in the 1st Annual Staff Sgt. Kyle Warren Memorial Match, hosted by the Amoskeag RFC. Warren played rugby for Amoskeag for four seasons before enlisting in the U.S. Army. Warren was born April 30, 1982, in Torrance, Calif. He moved to New Hampshire in 2003 and enlisted in the Army in October 2004. He entered as a Special Forces trainee and did his basic and advanced training at Fort Benning, Ga. He attended the John F. Kennedy Special Warfare Center and the Special Operations Medical Training Center. He earned his green beret in 2007 and was stationed at Fort Bragg, N.C., as a Special Forces medical sergeant. In July 2010, Warren deployed in support of Operation Enduring Freedom as a member of the Joint Special Operations Task Force - Afghanistan. It was his second deployment. Warren died in Tsagay, Afghan-istan, of injuries sustained when his military vehicle was attacked by insurgents with an improvised explosive device. In remembrance, the Amoskeag RFC wanted to play a match with a military team and invited the Barracks Rangers for the weekend. The match was preceded by the teams being led onto the pitch by a bagpipe player and a National Guard color guard. The Barracks Rangers presented a framed 10th Mountain Division Flag to Warren’s Family after the Amoskeag RFC spoke about his life as a great husband, son, friend and honorable Soldier. Amoskeag, a team that plays roughly two divisions higher than the Barracks Rangers, easily won the match, 55-10. But playing was not the only reason everyone gathered. After the match, there was a brief social time between the teams, followed by a few more presentations and fund raising event. All money raised was split 50/50 between Warren’s Family and the Wounded Warrior Project. The Barrack Rangers RFC will host the 2nd Annual Staff Sgt. Kyle Warren Rugby Match at Fort Drum in the spring of 2012. Both teams will come together again to celebrate the beginning of a brotherhood between the two rugby clubs, and also to celebrate the life of a fallen brother. Anyone interested in playing rugby for the Barracks Rangers RFC should attend practice at 5:30 p.m. Tuesdays and Thursdays at the Monti Physical Fitness Center fields on Fort Drum or contact rangersrugby@yahoo.com.